Toilet seats are lower to the ground than standard chairs. Due to the height of toilet seats, individuals with decreased leg strength may find rising from a toilet seat challenging. 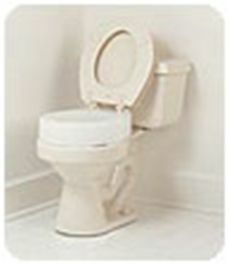 A raised toilet seat bolts into a standard toilet with little or no alterations. This seat raises the height of the toilet by 3 to 4 inches, decreasing the amount of leg strength required to stand. Grab bars may be attached to the frame of standard toilets. 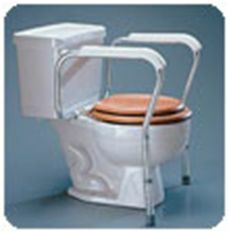 These handle bars will provide arm support when sitting on or standing from the toilet. 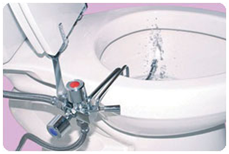 A raised toilet seat will not interfere with the installation of grab bars. This is a versatile piece of durable medical equipment. With the pale in the commode, it may be place by the bed and serve as a bed side commode. The floor of the pale may be removed and the unit placed over your toilet. As such, it will serve as handrails and a raised toilet seat for your toilet. Furthermore, most insurance companies will reimburse to cost of this equipment. 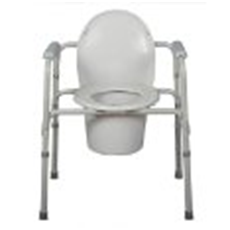 With arm weakness or decreased dexterity reaching behind to thoroughly complete toilet hygiene may become difficult. Two items that are pictured to the left have long handles and hold tissue paper. This decreases the amount a person must reach behind themselves after using the toilet. Another option is to purchase a bidet. A bidet is a French-style toilet and sprays warm water on an individual after the toilet is used. Several options are available for bidets. A new toilet may be purchased with this feature built in, or an attachable bidet (pictured left) may be installed into a standard toilet. Sink knobs that are straight require less force and less dexterity to turn. 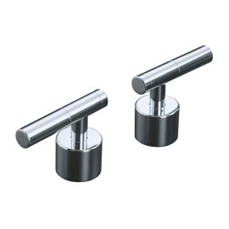 The knobs on your kitchen or bathroom sink can be exchanged with simple tools and little hardware.